St. Augustine’s history, culture, sandy beaches, and over 60 attractions provide a number of things to do to keep you entertained for your entire visit. But, a unique lineup of festivals, events, holiday festivities, and weekend parades also beckon travelers to visit the Historic Coast. During the weekends that St. Augustine hosts major special events, the City of St. Augustine provides free parking and free shuttle service on a first-come-first-serve basis. You’ll also find information on this page about year-round free shuttles, like that at the Amphitheatre or the First Friday Art Walk, as well as shuttles you can catch a ride with for a small fee. On the following dates, visitors of St. Augustine can use the free shuttle service to travel to major events. Riders can park for free at either of two locations and get picked up; the shuttle then drops them off between the Visitor Information Center and the Historic Downtown Parking Facility. Pick-ups and drop-offs are every 20 minutes. The San Marco Lot: 301 San Marco Ave. Visitors Information Center/Historic Parking Facility: 10 S. Castillo Dr. If you have any questions about the shuttle service please call (904) 209-4211 or email your questions to mobility@citystaug.com. Although the St. Augustine Amphitheatre boasts nearly 300 parking spots on-site, the parking lot often fills quickly. However, they also provide a free park and ride shuttle where patrons can park their vehicle for free, board a shuttle, and ride to Amphitheatre events. The free parking lots are within one mile of the venue and are periodically patrolled by security. The parking shuttles begin running one hour before events and continue running until one hour after events. Anastasia State Park, 300 Anastasia Park Rd. R.B. Hunt Elementary School Field, 190 Red Cox Dr. The First Friday Artwalk takes place on the first Friday of each month. The event is a collaboration by the St. Augustine art galleries, which are located throughout Historic Downtown. During the event, Ripley’s Red Sightseeing Trains and Old Town Trolleys provide shuttles free of charge to attendees. The Artwalk Shuttle is a shuttle-only service, meaning you still have to pay to park in St. Augustine. After you’ve parked your vehicle, the Artwalk Shuttle will pick you up at one of various pick-up and drop-off locations. The shuttles pick-up and drop-off attendees every thirty minutes. Check out the Artwalk Shuttle Map to find which location is most convenient for you. 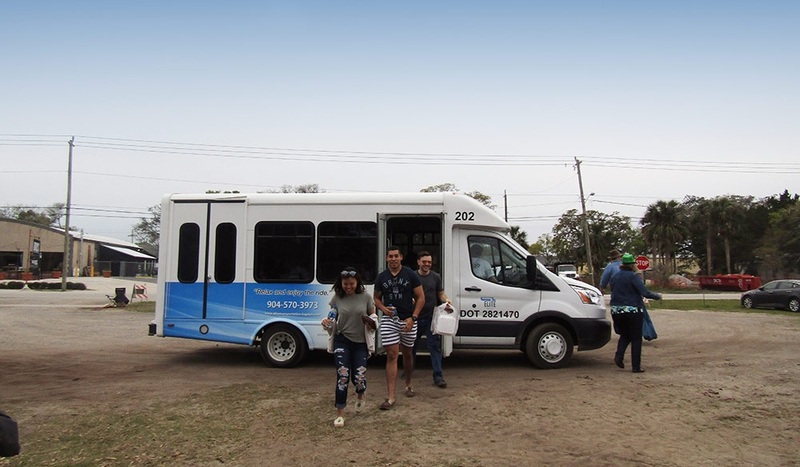 In addition to St. Augustine’s free shuttles, there are also multiple transportation shuttles that riders can use to get around. These shuttles range in price and are subject to change seasonally. For more information on prices, check out the website for each shuttle. Explore Tours & Pickups provides transportation to riders as well as other services. The golf-cart-like shuttles will pick you up and drop you off at your desired location downtown. Shuttle fare is $4 one way with a minimum of $6 per person. The pedicab shuttles of St. Augustine are pedal-operated bicycle rickshaws. Riders can call Pedicabs of St. Augustine and the driver will pick-up and drop-off riders at their desired location downtown. Each pedicab shuttle can transport two passengers. For pricing and more information, call them at (904) 501-4848. The trolleys in St. Augustine are run by Red Train Tours and Old Town Trolley Tours. This train-like shuttle is a great vessel for those who want to see the sights but also be able to get around the city without worry about parking or walking far distances. Check out each trolley’s website for pricing and for a map of pick-up and drop-off locations.